Adaptation Scotland has launched this blog to give you personal views from us in the team and our project partners – across Scotland and from further afield. Here you can keep up-to-date with wide-ranging activities that are helping Scotland rise to the challenge of a changing climate. Frankie Barrett, Sustainability Officer at Glasgow City Council, shares his reflections on Glasgow’s pioneering work to address long-term resilience challenges . The history of Glasgow presents an extraordinary story of a city that has remained resilient through over 250 years of successive shocks and stresses that have produced massive disparities in income, health and opportunity. With an ambition to be one of the most sustainable cities in Europe, we are recovering steadily from a post-industrial legacy of social, economic and environmental shock. By drawing on cultural assets, investing in major regeneration programmes and diversifying the business sector, the city has done much to remedy its symptoms as the “sick man of Europe”. But the journey is not over and our resilience continues to be tested by shifting macroeconomic trends, poverty and deprivation, and health inequalities. We have no choice but to continuously develop our ability to function in the face of challenging situations and recover from disasters. This entry was posted in Communities, Uncategorized and tagged adaptation, climate change, Glasgow, Glasgow City Council, resilient on January 23, 2015 by Anna Beswick. 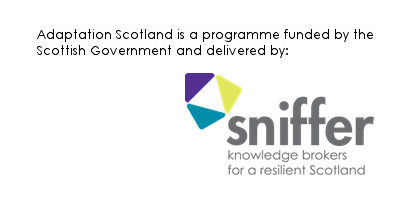 Within Sniffer we often say that no one organisation, business or community will be able to build resilience and adapt to climate change on its own. We need others and others need us. The same is true for the Adaptation Scotland programme. We’re a small team and our effectiveness in supporting a Climate Ready Scotland depends upon others sharing our messages and working with us to carry them forward within different organisations, sectors and communities. In my experience our most impactful work has come about as a result of working with people who have grasped the significance of adapting to climate change and been a driving force for change within their own spheres of influence. This is particularly true of our work in supporting climate ready communities. Last Wednesday (7th August) we ran a workshop with organisations and individuals from across Scotland who are at the forefront of pioneering early work to support communities to adapt to climate change. We were also joined by others who are new to the challenges of adapting to climate change but wanting to get involved and help move this area of work forwards. Adaptation Scotland’s presentation on our engagement with communities. Preparing for the workshop was a good opportunity to reflect on the progress that we’ve made over the last couple of years in supporting climate ready communities. This includes work to develop a programme of workshops to support community adaptation planning, consultation workshops with vulnerable individuals and support groups and, the early development of the Are You Ready? resource. Take a look at our Prezi presentation for a full overview of all the work that has been undertaken. This entry was posted in Communities, General and tagged adaptation, climate change, communities, scotland on August 12, 2013 by Anna Beswick.